Just to make one thing clear. In my opinion a factory sealed iPod first generation will never be worth $200 000! Ever. Not to a collector and not to a museum. Why? Why would a museum want to display a sealed box? I guess they would like to display an iPod, not a box. And a serious collector could buy a complete collection for that kind of money. Or send their kids to college. I often get questions about the value of different iPods. My standard response to this question is “It’s worth what someone is willing to pay”. I’m trying to be as honest as possible and I always try to help people to the best of my knowledge. Sometimes people get disappointed. This is often the case when they think the iPod is worth much more than it really is. The value of an iPod depends on many things. First it depends on who you ask. If you ask a collector it could be worth one thing. If you ask a user it could be worth another thing. And if you ask an Apple fan boy it could be worth a fortune. I value iPods from a collectors point of view. As a collector I value the overall condition on both the iPod and the accessories and packaging. The supply and demand also plays a huge part in determine the price. Suddenly everyone decide to sell their iPods at the same time and the prices drop drastically. Sometimes two collectors want the same iPod and the price skyrocket. There is also another factor to consider. 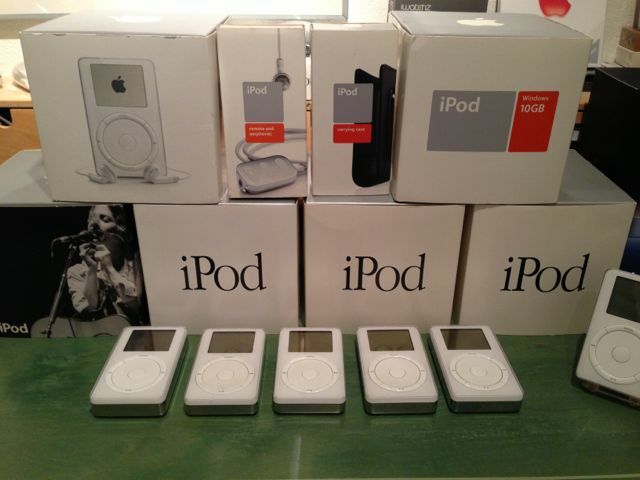 There are lots of people buying and selling iPods that are not “real” collectors. I call them opportunists! They are people who surely just want to make easy money. They buy what they think a collector would buy and hope to sell it again with a profit! They sell it to another opportunist and the snowball is rolling. After a couple of times on ebay, the iPod is suddenly “worth” a fortune! Other naive “do-not-have-a-clue” ebayers also see these insane auctions and think they could get plenty of $$$ for their banged-up, box-missing, no-good, scruffy-looking iPods. Soon enough a 5:th generation iPod is worth more money now, than when it was new. Still, an iPod is worth, what someone is willing to pay…I know! But honestly…some sellers on different marketplaces set huge pricetags on their iPods. buys the lot and sets a whole new standard to the collecting market, not based on collectors opinion, but rather investors and other opportunists imaginary values. This is my humble opinion, others may “think different”. This entry was posted in Value by Martin. Bookmark the permalink.